Ivonne Higuero, CITES Secretary-General The 18th meeting of the Conference of the Parties to the Convention on International Trade in Endangered Species of Wild Fauna and Flora (CITES) will take place at the Bandaranaike Memorial International Conference Hall in Colombo, Sri Lanka from 23 May to 3 June 2019. This will be the first meeting of the Conference of the Parties to CITES in South Asia since CoP3 held in New Delhi, India way back in 1981. It is a privilege and an honour for me to address you as I officially assume the office today as the Secretary-General of the Convention on International Trade in Endangered Species of Wild Fauna and Flora (CITES), and to be the first woman to have been chosen to lead its Secretariat. I am grateful for the confidence shown in me by the United Nations Secretary-General to ensure that the critical work of such a long-established Convention continues to be serviced efficiently and effectively by the Secretariat. John E. Scanlon 6 April, 2018 Perhaps due to my background as a lawyer, I always regarded CITES (the Convention on International Trade in Endangered Species of Wild Fauna and Flora) as a remarkable international legal agreement. A well-crafted and targeted founding text, a body of resolutions that had enabled the Convention to evolve over time, committed Parties and highly engaged stakeholders, all with a deep technical knowledge of the Convention. “Customs Enforcement: Securing Trade and Travel” Keynote address by John E. Scanlon, Secretary-General of CITES 19 March 2018 Committee Chair, Abigail Bradshaw, distinguished delegates, ladies and gentlemen. Just seven years ago in India’s magnificent Manas National Park, there were no tigers to speak of, just a few remnants of a population wiped out after decades of civil unrest that left the park’s wildlife vulnerable to persecution. UN World Wildlife Day 2018. Big Cats: Predators Under Threat! Opening Remarks by John E. Scanlon, Moderator and CITES Secretary-General 2 March 2018 Deputy Secretary-General, Excellences, Distinguished guests, friends of wildlife! A very warm welcome to all of you on this wild and wintery day to the 5th celebration of UN World Wildlife Day. 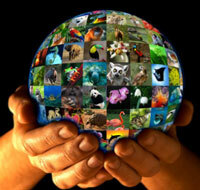 World Wildlife Day has today become the largest global annual celebration of wildlife. Big Cats: Predators Under Threat ‘CITES turns 45 as we celebrate the 5th World Wildlife Day’ 1 March, 2018, Washington DC, USA Director Christine Dawson Deputy Assistant Secretary Jim Walsh Colleagues Friends of Wildlife! I can think of no more appropriative place to be celebrating World Wildlife Day than right here in Washington DC, as it is what took place here on 3 March 1973 that served to inspire the Parties to CITES and the UN General Assembly in 2013 to declare 3 March as World Wildlife Day. CITES and Rural Communities Working Group meeting Opening remarks by Mr. John E. Scanlon, CITES Secretary-General 26 February, Geneva/Nairobi, 2018 Dear colleagues from CITES Parties and rural community representatives Good morning to you all! Let me start by expressing our deep gratitude to Namibia for leading the organization of this very important meeting of the Working Group on CITES and Rural Communities and to extend my particular thanks to our Working Group Chair, Louisa Mupetami. Completing my mandate as CITES Secretary-General February, 2018 John Scanlon giving keynote address at the World Travel and Tourism Council Global Summit, Bangkok, 2017 After serving for eight years as Secretary-General of the CITES Secretariat (and three years with the UN Environment Programme in Nairobi prior to that) I will soon be completing my mandate with the Convention and taking up my next career challenge.